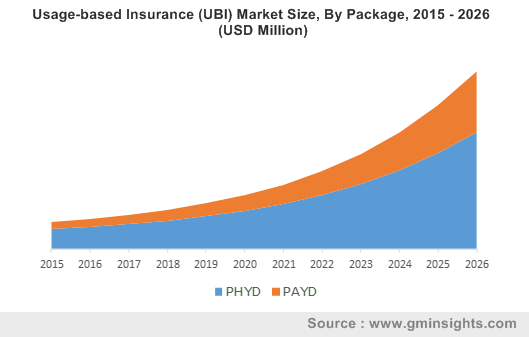 Usage-Based Insurance (UBI) Market size is set to exceed USD 107 billion by 2024; according to a new research report by Global Market Insights, Inc. The North America UBI market is projected to hold a majority market share of over 35% by 2024. The market growth is attributed to the factors such as the growth in the number of connected cars with inbuilt telematics solutions and the adoption of the cloud-based telematics solutions. The region is dominated by the presence of various car insurance companies that are using black box technology to track driving habits. The telematics-based black box devices provide detailed information to car insurance companies and let them calculate insurance risk levels more accurately. The insurance companies operating in the usage-based insurance market are entering into strategic partnerships with automakers and other car insurance service providers to jointly offer new insurance telematics solutions to the customers. For instance, in September 2016, Generali and Progressive collaborated to develop a new generation of customized car telematics solutions, which reward safe drivers based on their driving patterns. These solutions also help the companies to improve their individual data capabilities and boost product offerings. The insurance companies are adopting product differentiation strategies and introducing new UBI products and services to stay ahead of their competitors. For instance, in September 2018, Progressive introduced an Electronic Logging Device (ELD) UBI program, a Smart Haul for commercial truck drivers. The program offers qualifying truck drivers a minimum savings of 3% on their commercial auto policy period for signing up and adjusting insurance rates based on the ELD data.